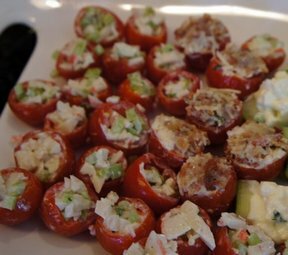 Either as a side dish or a vegetarian meal, these zucchini boats stuffed with onions and tomatoes will please everyone. Full of the flavors of fresh herbs, this is a perfect recipe for your seasonal zucchini. Trim ends and cut zucchini lengthwise in half. Using a spoon or melon baller, scoop out seeds to make a trench. Chop seeds and pulp. 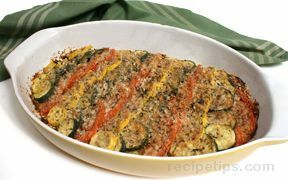 Place zucchini halves on a parchment paper-lined baking sheet and sprinkle with garlic powder; set aside. Heat oil in a skillet set on medium-high. Add onion and sautÃ© until translucent. Stir in chopped zucchini, tomato, salt and pepper. Cook a few minutes then add the fresh herbs. 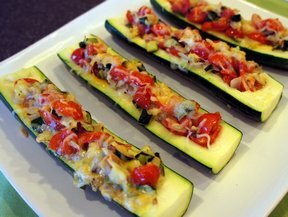 Spoon mixture evenly into zucchini halves and sprinkle cheese on top. 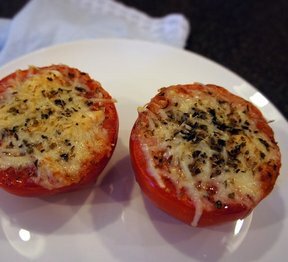 Bake for 20 minutes, until cheese is bubbling and brown around the edges.